When a stock hits a new 52-week high, it sends a message to investors that positive momentum is building up and that momentum should propel it even higher. When it comes on the back of an earnings beat – it’s a sure sign that the stock won’t be slowing down anytime soon. For one healthcare company, bullish momentum and solid annual revenue expectations are an opportunity combination that investors shouldn’t pass up. Baxter International Inc. (BAX) is a $43 billion medical instruments and supplies company that specializes in treatments for hemophilia, kidney disease, immune disorders, and more. The company operates through two main segments: BioScience and Medical Products. The company reported a 4th quarter earnings beat of $0.78 per share compared to the $0.73 per share that analysts had expected. For the full year, the company is expected to post earnings of $3.27 per share – a gain of more than 7% year-over-year. Despite the headwinds the company faced with its heart drug, Brevliboc, the company managed to exceed expectations and even raise its outlook going forward. Management issued annual 2019 guidance for revenue growth between 3% and 4% as well – a catalyst that sent the stock soaring higher. The stock was upgraded twice in January by Morgan Stanley and Citigroup from “underweight” to “overweight’ and “neutral” to “buy”, respectively. This could indicate that institutional investors have begun paying attention to Baxter. The influx of institutional buying could be another catalyst to keep the stock trending higher. The stock trades cheaply at 26 times earnings compared to the industry average of 48 times earnings. It comes with a price-to-earnings-to-growth ratio of less than 2 – a sign that the stock isn’t overvalued, despite the recent climb. It also comes with a small 0.90% dividend yield, helping to protect investors from strong downside movement as well. Baxter hit a new 52-week high following its impressive 4th quarter EPS results with the stock now up more than 23% year-to-date. 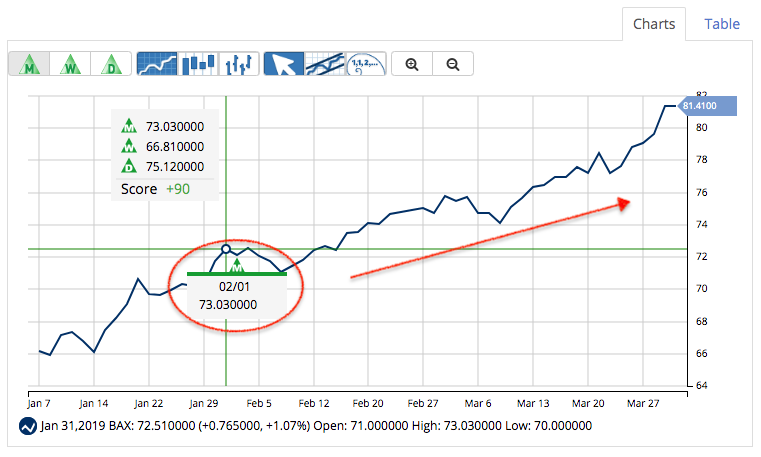 The stock has moved above the 20-day and 90-day SMA with the spread between them growing as buying activity increases. Purchasing volumes have been slightly higher than usual as well – another indicator of strong support for the bullish trend upwards. Based on Baxter’s full-year EPS estimates, this stock should be fairly valued at around $88 per share – a gain of around 10% with the dividend reinvested. For investors, this fast-moving stock could be a solid growth play for 2019. Based on a full analysis, MarketClub agrees that Baxter International Inc. (BAX) is in a strong uptrend fueled by insiders and price momentum. Members received a green entry signal on 2/1/19 at $73.03. Since then, BAX has continued to hit new all-time highs. 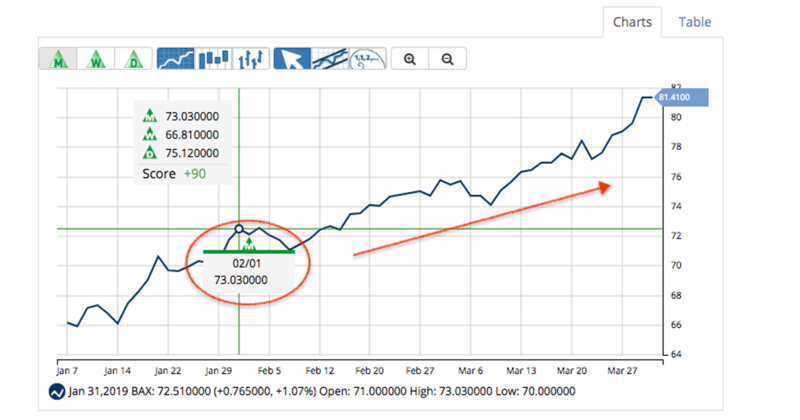 As of 4/1/19, BAX is trading at $81.41, up $8.38/share since our signal – that’s an 11.4% move for members. 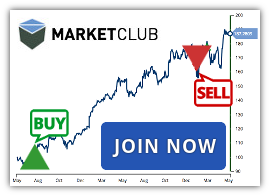 While this upward trend remains strong, MarketClub members would be waiting for a new exit signal to pull out of this position. Request a free daily report for BAX (or any other US or Canadian stock).